Welcome by today! It's so nice to have you visit me. Today I'm sharing a Christmas card that I was inspired to create when I saw the Make It Monday Challenge on Nichole Heady's Blog by Dawn McVey. I had fun with it. I used some Carta Bella Christmas Delivery patterned papers, red jingle bells, black burlap string, the Love Lives Here Stamp Set from PTI, and I used the Button Card Die to create my window. Pretty simple card, really. This sweet little tutorial helped my card come together rather quickly and nicely. 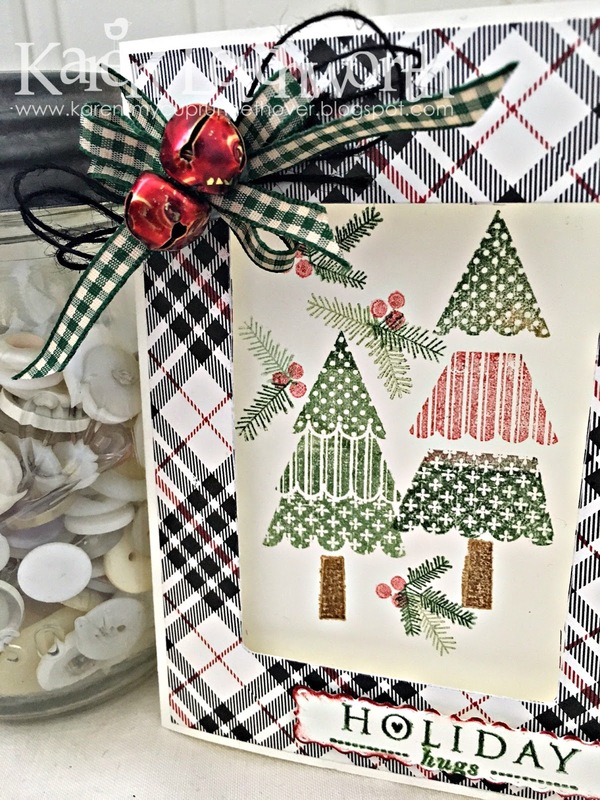 I love the idea of cutting the window in your card by die-cutting a hole that peeks through into the inside of your card, and stamping the focal point on the inside. Something new for me! Here are the challenges where I will be sharing this card. I hope you will come and play along as well. Challenges are fun, and it's always the best when everyone joins the fun! 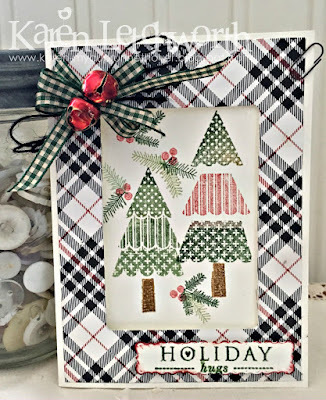 Simon Says Stamp Wednesday Challenge - Simon Says "Christmas"
Nichole Heady's Papertrey Ink Blog - Make It Monday Challenge #299 - Dawn McVey has a fabulous sentiment window tutorial on the blog today. 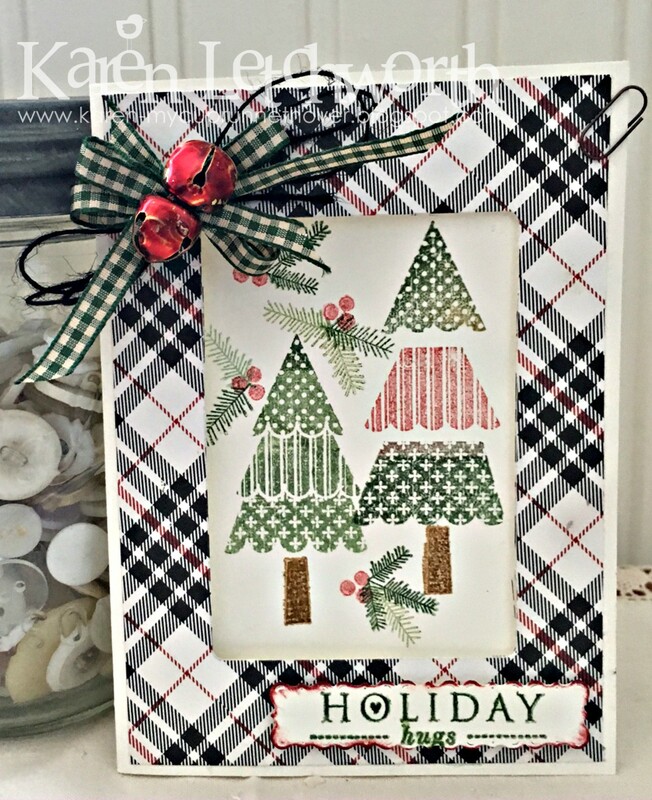 I used the PTI Love Lives Here Stamp Set for my sentiment, holly, berries and Christmas Trees. I used the PTI Button Card Die to create my window. Just Keep On Creating - October Anything Goes Link-Up - Special thanks to SuzARTe for all her hard work in organizing these challenges that inspire us all to create and share! Simon Says Stamp Blog - World Cardmaking Day Celebration - Anything Goes - I'm playing along to celebrate National Card-Making Day. What a fun celebration! Thanks, Simon Says Stamp. Thanks again for visiting me today, and have a wonderful week! Karen, that ribbon with the bells is so gorgeous. That stamps are beautiful and a great combo with this paper. Such lovely card!!! Very elegant and LOVE the choice of patterns and the cute trees! Such a cozy warm and wonderful card, Karen! Beautiful! Beautiful card!!!! Love the pretty bow! 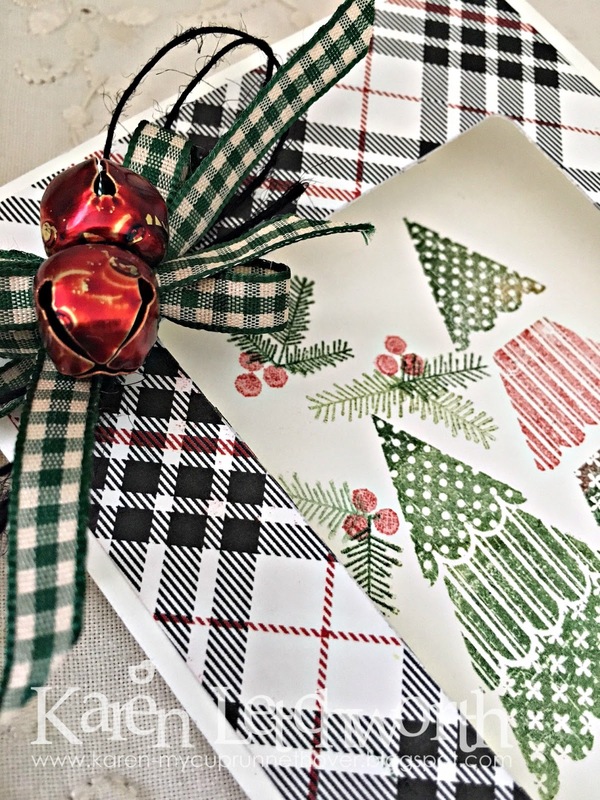 Beautiful card, Karen--love that plaid! Your sentiment isn't in the window, but it's a great card! Fun trees and love the plaid and bells and ribbons. Great awesome card.